A black and white negative of a portrait of Mr. Charles McGowan Skelton. Mr. Charles McGowan Skelton was born at Glasgow, Lanarkshire, Scotland, on September 12, 1920, and spent his youth in Toronto. During the Second World War he served overseas with the Royal Canadian Air Force in the Intelligence Branch. He was President of the Royal Canadian Legion Branch 112 in 1969, and was a zone commander. He served on the Executive of Highland Creek Branch, Royal Canadian Legion Branch 258. Mr. Skelton was a recipient of the Royal Canadian Legion Service Medal and the Queen Elizabeth Silver Jubilee Medal. He was an Inspector in the Quality Control Department at General Motors in Oshawa. 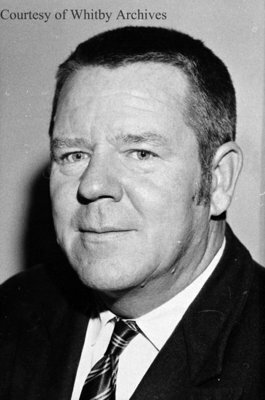 Mr. Skelton died at Whitby on October 4, 1979 and was buried at Groveside Cemetery, Brooklin. Charles McGowan Skelton, 1969, Photographer Unknown. Whitby Archives A2016_017_039A.